I met one of my oldest friends for a few beers in Liverpool yesterday. John now lives in Australia, but comes to see his elderly mother once a year or so. We always meet up and chat about what we are doing now and of course our times boozing, playing football, darts and the like in Scousley 30 odd years ago. It is a lot of fun. Less fun was the Northern train journey to Liverpool. Bad enough having to use that useless shower - I've already experienced their gross incompetence first hand while changing trains at Preston in my recent frequent trips to Scotland. Listening to the litany of cancelled trains as well as enduring their inherent inability to run a train on time has given me a healthy dislike of the company. And that's even before you suffer their wretched Class 142s, built over 40 years ago. Bloody boneshakers. Yesterday's trip was by no means enhanced by the closure of Lime St station for upgrade. This meant a change at Liverpool South Parkway and a Merseyrail train to Moorfields, so we arranged to meet at an old haunt, the Lion, handy for the station and a fine traditional, corridored, multiroomed pub in which we originally drank Walkers, but now has many taps to choose from. At lunchtime, the pub being in Liverpool's business area, was actually fairly quiet, but a few diehards in suits gave it some atmosphere. Despite my two hour journey, I was early, so found a prime spot where I could watch the workers scurrying out for lunch and, with a pint of Peerless and the Times crossword, I was pretty much happy. John, who has become an Australian Rugby League fan in his exile arrived a little late having persuaded some sports bar or other to beam in an important game live from Sydney. His team had won and after greeting him and a mate who I knew of, but hadn't met, we settled down to drink and chat. 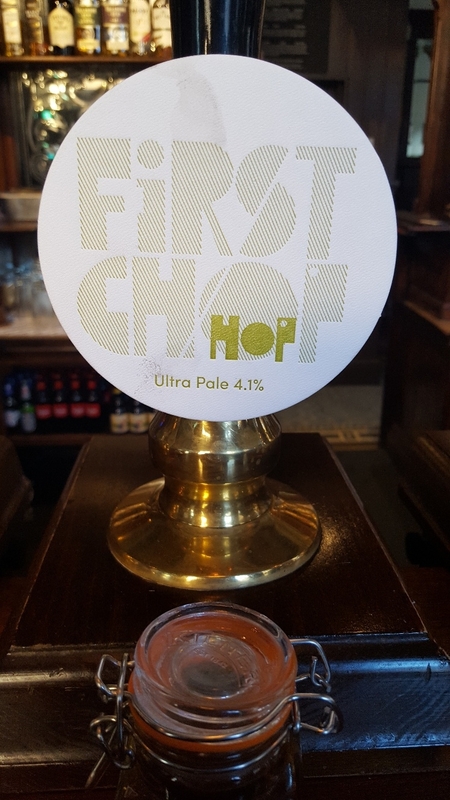 I hadn't really liked my first beer enough to order a second, so changed to First Chop Hop. The boys ordered the same and we got on with the serious business of supping ale and chatting. Time flew and one round, melted into another. We considered moving to a different pub, but all agreed we were just fine where we were. Pints mounted up and mostly we had the pub to ourselves, with the barman pitching in now and then to avoid boredom. Eventually around seven o'clock I decided I'd better get back to Manchester. We'd been there, putting the world right for about five and half hours. We stuck with the same round throughout and all left, pleasantly buzzed, but not at all drunk. Me for a further two hours on the train and the lads to get a bus home. Later in Middleton, E met me off my bus from Manchester. "Thought you'd be pissed" she said. "Not me" I replied. And surprisingly, despite a certain nine pints, I wasn't. 4.1% beer drunk at a rate of around a pint every half hour was the kind of old fashioned steady drinking which is less frequent now. Not chopping or changing was refreshing in its own way and is to be recommended, even if the quantity isn't! Both Merseyrail trains were on time. I'd also forgotten how big and deep underground Moorfields is. Liverpool South Parkway was also rather impressive and larger than I'd imagined. I come from a railway family and like these sort of things. Nine pints? Blimey. I got up to seven once, but I really knew about it by the end of the night. Nine pints at 4%ish is 20 units give or take; I guess you were getting home about ten o'clock, so that's ten hours. Process 1 unit per hour and... you should still have been the equivalent of four pints down when you got home. Nothing like a good long journey home for sobering up, mind you. Well the lad was home from Oz. Felt fine today. Wouldn't want to do it all the time mind. And he isn't a big lad. Great work. If the beer is good enough in an afternoon session, why move to a pub where the beer is going more slowly. I was interested to read about the Lion following events over recent years. Five years ago you were guaranteed a top pint of Lees Bitter, if not a seat, on a Friday night. I hold one of my three monthly acoustic song sessions in the Lion (2nd Tuesday of the month) in the back room with the glass dome. As for nine pints: I had 8.5 last night in around three hours, 5.5 of them being Titanic Plum Porter, which was very drinkable. The other three pints were from Bowland and George Wright. All were £2.60 a pint. I feel fine today. Out of interest, TM: the licensee Dave used to work for the DSS in a Liverpool office (no idea which one). There seems to be an intangible factor as to how drunk you feel after x pints, beyond the obvious factors (strength, speed, whether you eat before/with them, body mass, and of course how used to it you are), which may be down to age, mood, temperature or something else. Like you say, I've done afternoon crawls which involved drinking eight pints and not felt particlularly drunk, but on the other hand I once went round three pubs between trains in Burton-on-Trent in a bit less than an hour and drank five pints which I definitely felt the effect of when boarding my onward connection. I felt the effect after two pints in Dumbarton last week. As you say varying factors likely the cause. "He drinks some kind of pale ale/hybrid thing in Oz." Stone and Wood Pacific Ale per chance? Ubiquitous round these parts. I hadn't had a drink for a month until I met my sons at Brighton yesterday to watch Australia have a warm-up game against Sussex. The ground was serving Harveys - in plastic glasses obviously and it was good enough for five pints.We then moved on to a pub to watch the England game and had a couple of pints of some craft IPA and then a bottle of wine over dinner. I've felt dreadful all day. Wish I had your constitution Mr Tandleman.